Economic growth downgraded from 2.0% to 1.8% and to 1.1% in 2017. This is one of the key findings from the Q3 2016 ICAEW Economic Forecast. 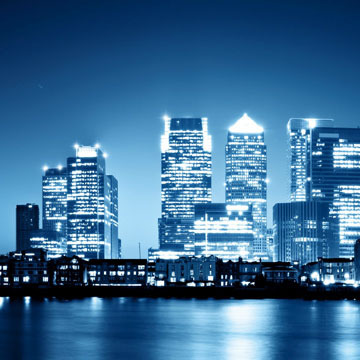 The ICAEW Economic Forecast is based on the views of the people running UK plc; ICAEW Chartered Accountants working in businesses of all types, across every economic sector and in all regions of the UK, surveyed through the quarterly ICAEW/Grant Thornton UK Business Confidence Monitor (BCM). The modest growth we can expect in the UK economy in the coming year will be driven by consumer demand, which seems likely to be dampened by the aftershocks of Brexit. More positively, there should be some boost to net exports from a weaker pound. Business investment is forecast to fall 2.9% in 2016, and 3.7% in 2017 (following a rise of 5% in 2015). The BCM survey demonstrates that business confidence has taken a major knock following the decision to leave the EU. Capital spending is likely to remain on hold pending clarity on the UK’s relationship with Europe. The labour market will lose momentum, with a modest upturn in unemployment. ICAEW expects private-sector employment growth to slow from 1.8% in 2015 to 1.1% in 2016, with headcount broadly flat over the year in 2017. The unemployment rate will tick up from 5.1% in 2016 to 5.3% in 2017. Wage growth will be spurred by legislative changes rather than labour market strength. ICAEW’s forecast for wage growth is 1.7% in 2017, modestly higher than 2016, but largely as a result of the new National Living Wage. Higher inflation, arising from a weaker pound, will mean this delivers real gains for households. Further policy support seems a done deal. August’s rate cut took interest rates to 0.25%, but the Monetary Policy Committee’s (MPC) statement made clear there could be more to come. Meanwhile the Chancellor has emphasised that supporting the economy trumps pre-Brexit fiscal targets, meaning we may see some easing of public spending in his Autumn Statement. You can find out more about business confidence in Northern England at our regular ICAEW Business Confidence Monitor (BCM) Briefing breakfast and lunches.We hold these regularly to discuss the findings of the latest quarterly ICAEW/Grant Thornton UK Business Confidence Monitor (BCM) report. 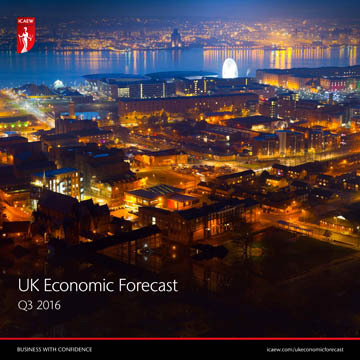 You can also download the Q3 2016 ICAEW Economic Forecast.